Did you know that the average employee wastes approximately an entire work week of time each year on slow computer performance and slow Internet connectivity? A study by Sandisk found that the most common and time-consuming delays were caused by waiting for necessary file uploads and downloads to complete. I may not be objective, but, I believe that failing to upgrade to Gigabit Internet connectivity (1000 Mbps) could be costing your organization time and money. An upgrade to Gigabit Internet is about speed. But if you’re considering a switch to Gigabit Internet delivered over fiber, it’s worthwhile to consider the business-wide benefits that could flow from remarkably high-speed fiber Internet. Your organization could unlock the ability to use new digitally-based services for vendor management, customer relationship management and other business processes. You may also be better able to improve the value of employee time, become better at recruitment as the Millennial Generation expects high speed Internet connectivity in the workplace, and comfortably converge your voice and data networks. If you’re wondering how Gigabit Internet is different than fiber and high-speed Internet and how it can benefit your business, you’re in the right place. 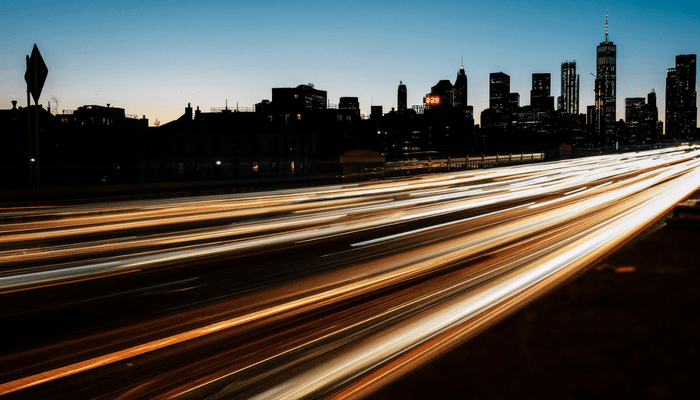 Read on for the definition of Gigabit Internet, and to learn how more speed and bandwidth could transform your entire business. What is Gigabit Internet Connectivity? Gigabit Internet Connectivity is defined as Internet connectivity with speeds of 1000 megabits per second (Mbps) for both upload and download delivered over fiber-optic Internet lines. Since 1000 Mbps are one Gigabit, one Gigabit per second is commonly abbreviated as “1 Gbps.” Gigabit Internet is approximately 100 times faster than the average residential high-speed broadband service. How Common is Gigabit Internet Service? The short answer to this question is that it’s widely-available, If you’re in a major metro area, such as Washington DC, and have access to a major carrier for fiber-optic Internet service, you most likely have access to Gigabit Internet service. Business Internet offerings can vary significantly between fiber Internet providers, such as Atlantech Online, Comcast, Verizon, and others. The offerings of one provider may not be an easy comparison to another. In many cases, the fine print in the service packages can detail that Gigabit Internet Service only offers speeds “up to” 1,000 Mbps--which may not be true Gigabit Internet Service during periods of high-demand. The point is, several years ago, a gigabit of speed was staggeringly fast. Now, as organizations adopt Unified Communications as a Service and more streaming services, it’s more often a need. If you are considering gigabit service, make sure that you’re not paying for speed “up to” a 1,000 Mbps instead of a speed and bandwidth guarantee. To learn more about how to compare your Gigabit Internet service options and other types of packages across providers, we recommend Comparing Commercial Internet Plans. If you’re trying to build a case for Gigabit Internet connectivity, you need to convince your boss that the upgrade could mean more than lightning-fast Internet speeds. In other words, that 1,000 Mbps of fiber Internet connectivity could move your entire organization towards your long-term goals. There are both financial and non-financial benefits associated with Gigabit Internet, which can include happier employees, an improved company image, and more. We’ve detailed a few below. The average business can stand to save $33,000 each year on travel costs by switching to video conferencing, according to a LyteSpark study. However, the real ROI of better video conferencing and deeper video chat adoption isn’t just costs saved. It can fall into categories such as customer satisfaction. Can you imagine the damage to your company image if your Internet bandwidth drops because of network congestion in the middle of important video calls? Switching to Gigabit Internet can reduce reputation and satisfaction risks associated with lower-quality, slower speed Internet service. Gigabit Internet can open the door to new possibilities around digital transformation, including opportunities for your organization to develop new digitally-based revenue streams. According to Gartner researchers, digitally-earned revenue can have better financial characteristics than traditional revenue streams. In a fast-changing business climate, developing diverse products and services could secure your organization’s path to the future. Sell Existing Digital Assets: Existing digital assets could be easily delivered and monetized through digital delivery. Digitize a Product or Service: In some cases, existing products or services may qualify for digital delivery, such as digital-based consulting. Sell Metered Revenue: Digital delivery can enable the pay-as-you-go approach to service delivery, such as Teledoctors and eMedicine. Run a Platform-Based Business: Software-as-a-Service, on-demand applications, and other platforms. Move into Adjacent or New Industries: At-risk industries can explore the development of entirely new business models and products. Gigabit Internet could increase the value of employee time by decreasing time wasted by slow Internet connectivity. How much time and productivity is squandered each year by insufficient bandwidth and unreliable Internet connectivity when employees are stuck waiting for slow uploads or connectivity to be restored? According to one source, slow Internet connectivity may account for 8% of employee time and inactivity each year. Each minute an employee spends waiting on slow Internet is a minute paid by the business. As organizations switch to increasingly digitally-based methods of communication and collaboration, the cost of slow Internet increases. Heavy file-sharing and online applications can increase bandwidth demands, which in turn slows Internet speeds further and leads to more time spent waiting on slow Internet. For many organizations, the slight costs associated with an upgrade to Gigabit Internet lead to much more significant employee time savings. Employee morale and engagement is a competitive advantage. While engagement is a byproduct of the sum employee experience, the environment and technology can play a significant role in how effectively employees are able to do their jobs. Sub-par technology and slow Internet connectivity can inhibit employee productivity. Frustrated, stressed employees may contribute to an environment with lagging morale. Upgrading to Gigabit Internet can support strong Internal communications and collaboration. When combined with other attributes of a workplace environment which supports strong employee engagement, such as strong employee recognition systems and a healthy organizational culture, your company could appreciate happier employees and better talent retention. According to a recent survey, 80% of millennials workforce believe an “agile work environment...increases productivity, creativity, and job satisfaction.” Recruiting the right talent to achieve and maintain a competitive advantage requires today’s organizations to get the right technology in place to support agile working styles, including flexible collaboration tools and mobile-optimized communication systems. Gigabit Internet over fiber is likely at the core of unified, cloud-based communications. The current talent shortage, according to Forbes, has created intense competition between employers to both hire and improve employee onboarding processes. According to the same source, employees are more likely than ever before to quit within 90 days of being hired. In an age where employees have more choice than ever about where they work, it’s important to demonstrate to newly-hired staff that your organization provides the tools needed to get the job done. Gigabit Internet service could prove an immense benefit in a tight talent market for both recruitment and new hire retention by enabling your organization to attract and onboard the right talent. What Does Gigabit Internet Cost? There are two factors associated with Gigabit Internet service. These include the cost of initial installation and the monthly service costs of your fiber Internet package. Both can vary, depending on the details of your installation and your provider. The cost of upgrading to Gigabit Internet can vary significantly, but it ultimately depends on fiber Internet availability in your building or area. If your building is currently installed with fiber-optic Internet resources, your upgrade to Gigabit Internet could be very fast and low-cost. For an in-depth look at each of these variables, we recommend How Much Does it Cost to Get Fiber Internet Installed in My Building? Ultimately, the only way to know for sure how much it will cost your organization to install fiber is to have an on-site evaluation done with a local provider who can guide you through local variables, your proximity to fiber resources, and evaluate the details of your facility. After the initial costs of installation, your organization will pay a monthly fee for Gigabit Internet service. The costs of this service can vary significantly, depending on your location, the carriers who provide fiber service in your area, and the terms of your agreement. Generally, your organization wants “symmetrical” service, which is equal upload and download speeds of 1,000 Mbps. Not all carriers offer the same uptime and proactive monitoring guarantees, and many major carriers do not guarantee speed and bandwidth during periods of high demand. Ensure your prospective provider offers 99.99% uptime or better. Does the pricing you’re initially agreeing to extend to the length of your service contract? Is Gigabit Internet Service the Right Option for You? If your organization has a need for high-speed Internet and a lot of bandwidth, you may be well-served by a switch to Gigabit Internet service over fiber. However, while gigabit over fiber sounds exciting, it also best to fully understand your options such as high-speed Internet over copper cable--which may be a lower-cost installation but offer less speed and bandwidth and reliability. As your organization pursues digital transformation, your need for speed and bandwidth is not going to diminish. In fact, your demand for streaming and video conferencing and multi-device use is only going to increase. There’s a chance that in the near future, 1,000 Mbps may not be enough and you may need to upgrade to 2 Gigabits of Internet service. Just the other day, I submitted two separate quotes for 10 Gigabit Ethernet Internet connections! By making the switch to fiber-optic Internet service, you can secure a pathway to high-security, high-speed, and high-bandwidth connectivity for the future. Before you switch to Gigabit Internet service, there are a few things you need to know. 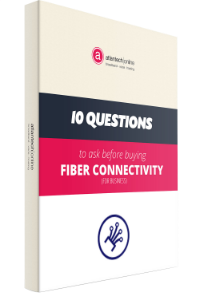 In this free guide, the experts at Atlantech online have compiled the top questions businesses need to ask before choosing a fiber provider. To learn more, download 10 Questions to Ask Before Buying Fiber Connectivity for Your Business.